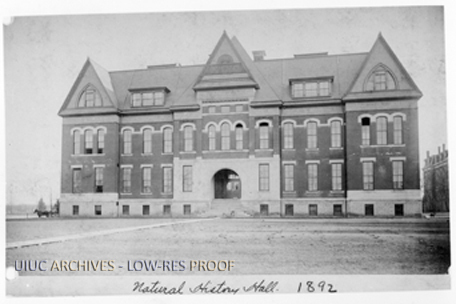 The Natural History Building was dedicated on November 16th, 1892, officially opening to the University of Illinois. A profound American geologist, Dr, T.C. Chamberlain, opened the event by speaking about the importance of science and intellectual studies. He spoke of the outstanding moral turn the time had taken by their extensive studies in science. The Natural History building was now home to such studies and became an icon of the growing University. The building has since gained additions and partition walls to change the purposes of the space within the building. The renovations nearly tripled the amount of learning space. In fact, one of the old labs has been transformed into a geology library. 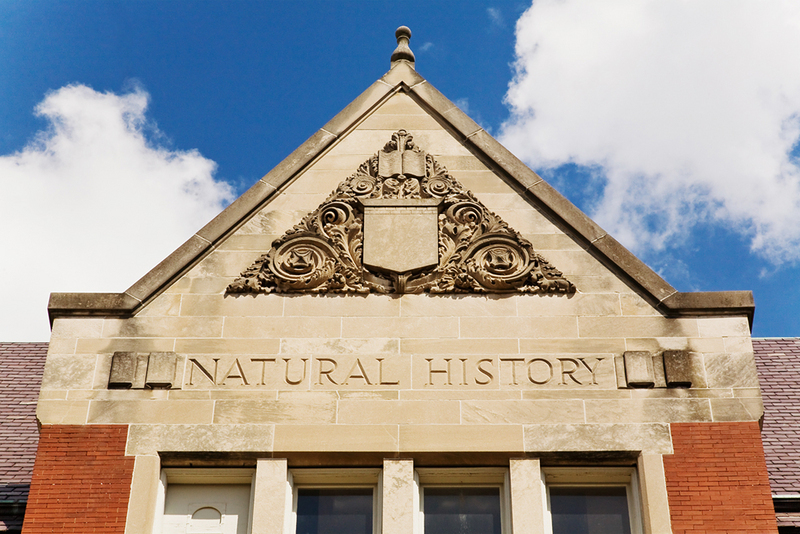 Though there have been changes, the Natural History Building is still viewed to be a stately piece of architecture that the University is proud to call theirs. 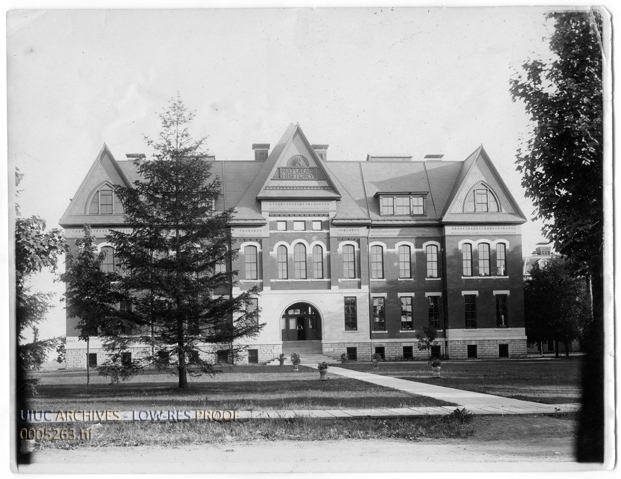 When it was initially built, the National History Building held the Natural History and American Culture Museum. 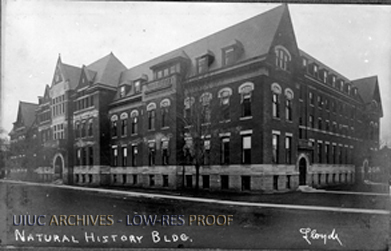 As it has aged, it has primarily evolved into an academic building. The building holds classes in the department of building of geology, botany and zoology. Every floor has a rather large hallway lined with cases full of fossils and other natural historical remains. This four story Victorian Gothic structure was originally envisioned by architect Nathan Ricker to compliment Altgeld Hall, one of his most recognizable buildings on campus. The construction of this building was yet another step towards modernizing what was once widely considered to be the “cow college”. The intricate brick, stone and slate façade adds a certain elegance to the structure. State of the art heating and lighting fixtures were also installed. The beauty and functionality was ahead of its time. 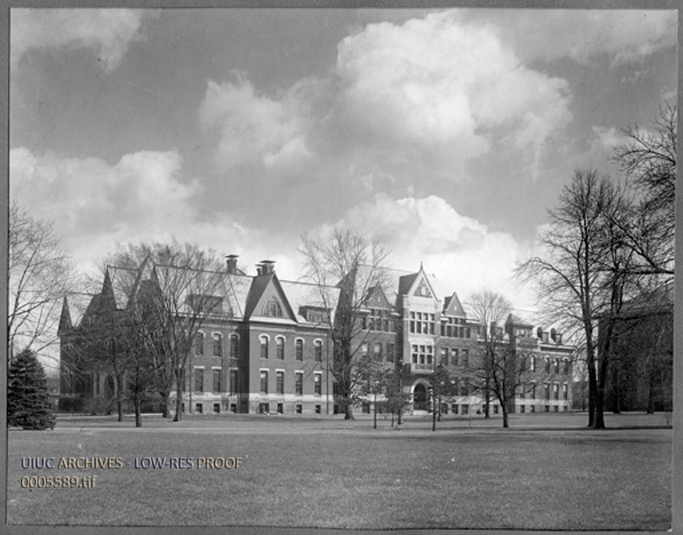 Soon after its dedication, the Daily Illini recognized the Natural History Building as “… a beauty and excellence for its construction, the best on the University Grounds”(Daily Illini, 3/12/1891) The stately building now holds many academic classes, laboratories and small exhibits. Nathan Clifford Ricker is known for being the first person to receive a Degree in Architecture in the United States. He later gained the title as “Master Architect” by Alpha Chi Rho. Within the history of his work, he had a pattern of emphasizing technical architectural aspects. As the “Master Architect”, Ricker was able to make these aspects prominent within multiple buildings on the University of Illinois campus. Harker Hall (originally Chemical Laboratory): 1305 West Green Street in Urbana, Illinois. Top of natural history building with inscription: Image courtesy University of Illinois Public Affairs. Copyright University of Illinois Board of Trustees. Fitzgerald, Shannon, Tianchen Li, and Shibei Liu, “Natural History Building,” ExploreCU, accessed April 20, 2019, https://explorecu.org/items/show/286.